With many workplaces, schools, universities and offices using laptop computers, laptop security is essential. The BioCote In-Charge range of laptop lockers is designed to provide a secure and tidy means of charging and storing your organisation's laptops and tablets - avoiding all those trailing cables. 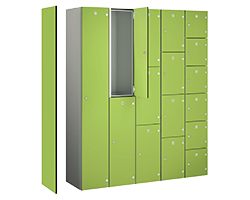 Each compartment of the locker has its own door and cam lock (supplied with 2 keys as standard). Other lock types are available as an optional extra. The doors are available in seven colours (light grey, blue, red, burgundy, green, dark grey and yellow) so you can be sure to find a locker to match your office dècor or organisational colours. Each compartment is fitted out with a three pin UK socket - a power lead is supplied with an RCD, this plugs in to the locker and enables easy replacement of the lead if it becomes damaged. All doors are independently earthed to the locker body. Each shelf has an additional front-to-rear reinforcing box section for enhanced strength and durability. To prevent heat build up during charging, one side of the locker and the doors are vented. Flat top or sloping top options are available - the sloping top is a great way to keep the top of lockers clutter-free and hygienic.